The hiking trails with the most bigfoot sightings! It doesn’t matter if you believe in Bigfoot or not. He doesn’t care. Whatever may you believe, A elder ancestor or cousin from similar evolutionary origins? An ancient cultural memory embedded in our species whenever we’re in the woods? A huge hoax by the national park systems and Native Americans? Sasquatch may be all or none of these things. But with an ever-mounting body of anecdotal and physical clues, the truth may soon be ascertained with some degree of certainty. While we wait for answers, why not seek your own? Bigfeet — plural for bigfoot? — (allegedly) inhabit some of North America’s most beautiful expanses of wilderness that are worth exploring regardless of the presence of feral hominids. These hikes are located in prime sighting hot spots, so whether or not you embark on them in a spirit of bemused irony or genuine seeking, you may see (or hear, or smell) something to confirm your suspicions. Washington’s Pierce County is currently the board leader for reported bigfoot encounters. Instead of scaling Mt. Rainier, though, why not take an only moderately difficult 6-mile stroll up to a lookout with incredible views of Rainier, among other mountains? If you feel like you’re being watched, take a look around. While you’re enjoying the views, something may be viewing you. This trail is close to the town of Ashford, which is a contender for Bigfoot Capital of the World. Just recently, in March, a man testing an offroad vehicle saw what he described as ‘an oversized gorilla’ crossing the road. Which confronts us with the thrilling question: why did the apeman cross the road? For directions to the hike, and more details, go here. The Six Rivers National Forest is a stunningly beautiful wilderness that also happens to boast a healthy population of Sasquatch. Or so they claim. The Craig’s Creek Trail is a great way to drink in the scenery. 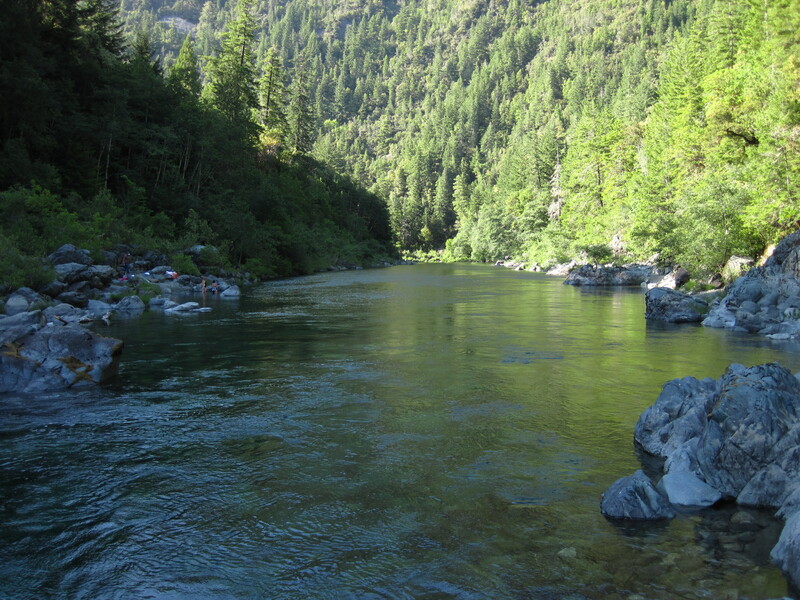 Running alongside the South Fork of the Smith River, this trail often veers off into the dense, surrounding forest, where forms in the trees may play tricks on you (or may not). It’s about a six and a half mile round trip, and is fairly easy going, with basically no elevation gain. The Craig’s Creek Trail, just outside the town of Hiouchi, is in the same county as Bluff Creek, where the Patterson film was shot. This iconic piece of footage shows what appears to be a female sasquatch gambolling across a rocky stretch of riverbank before disappearing into the trees. Del Norte County continues to produce sightings on a regular basis. Click this link for more specifics about the hike. While there are more Bigfoot sightings in Washington than any other state, Oregon, perhaps unsurprisingly, comes in second. 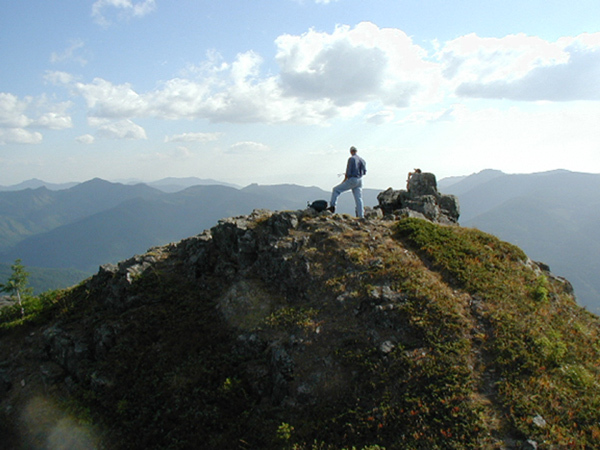 Clackamas County is a popular destination for hikers and Sasquatches alike, and the Table Rock Wilderness Area offers some amazing trails. An 8-mile loop takes you up a moderately difficult incline and ends with an incredible view of Mt. Hood and the surrounding area. Keep an eye out for black bears and foxes. A group of campers outside of nearby Estacada had a spooky experience one night, when an otherwise peaceful trip was interrupted by wood knocking, rock clacking and the sound of heavy breathing just beyond the light of a campfire. Read the full account here. On your hike, try hitting a tree with a large stick and then wait to see if anyone answers. For more details about Table Rock, click here. Florida is a surprising hotbed of ‘Squatch activity, and the Big Cypress Preserve appears to be the epicenter. This 729,000-acre swamp is home to a huge diversity of non-bipedal wildlife as well. 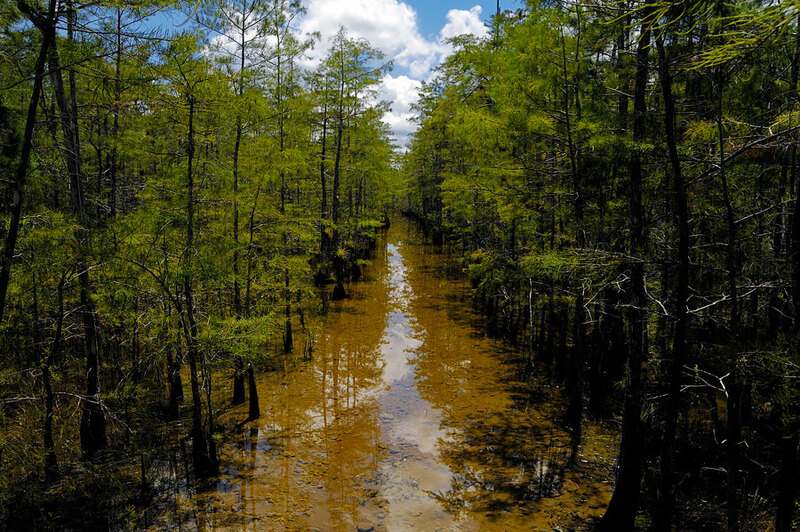 The mucky terrain can make for difficult hiking, so for a relatively easy day hike, try the 8-mile stretch of the Florida Trail between Loop Road and Oasis as it winds through prairie, Rockland and cypress stands. Or, for the full experience, try the 30-mile, multi-day backpacking route between Oasis and the I-75 rest area. Keep an eye out for cottonmouths, and an ear out for strange bellows. For more info about hiking routes, go here. When you think of Sasquatch, you probably don’t think of Ohio. But it is in fourth place, behind Washington, Oregon, and California. Maybe they’re Browns fans. The Plateau Trail, located outside of Peninsula, is a 5-mile loop that’s flat enough to accommodate hiking and biking alike. It meanders through pine forest and over some charming footbridges, and is particularly beautiful in the fall. 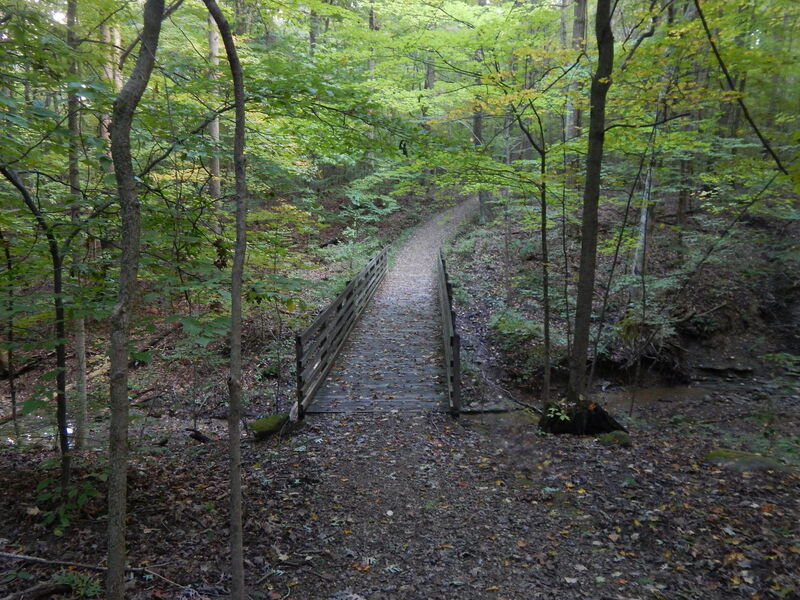 It is located in the Cuyahoga Valley National Park, and although at 20,000 acres it is relatively small as far as national parks go, it has produced a number of interesting Bigfoot anecdotes from nearby residents, including this one from last year. ‘Two really big and tall dudes’ were observed walking in an odd conga-line formation across a field. If you decide to go hiking to one of these trails please bring a good DAMN camera. Did you enjoy this article? Do you know of any cool trails to share? Let us know in the comments!